I'm using VRS and enjoying it greatly.. This plane flew over my house and can be seen landing at 120.8 mph. There are hills between here (4.34 miles east of the air port) and the runway. LOS occurs right between US-95 and Hartwell ave. But strangely, I'm able to get a few GND squawks from planes near the center of the runway. Have not seen any AC on the GND with other display programs..
Well I put Richard and I really do not like, you know nothing about likes writing, I now use my own cards Planeplotter Cruising Active Display more. and I think I'm leaving the subject well. I'm not sure what that language translation program is doing. Your post is a bit confusing. The point of my post could be better explained.. I think it's a little odd, that I can hear planes on the local runway, because there is no line-of-sight path. 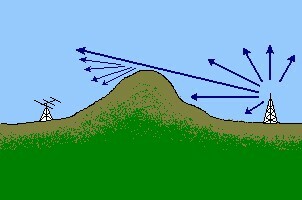 Theoretically, I should not be able to hear those planes, because of the large hills between me and the airport..
Maybe it's 'edge refraction' of the 1090 Mhz signals?? Seems like the only possibility. Maybe VRS has a bug..?. I don't think my antenna is really that good.. Still getting an 11 signal level at 10,090 miles? Jaajajajajjaa. gooddddddd Richard That flight will not be the 777 lost?. Care maybe you've found. Richard tell me exactly which area you live will send letters tailored to your area, coverage area and tell me you touch airports in ICAO. I'm about 12 miles north of KBOS (Logan airport Boston) and 3 miles east of KBED. Another small jet breaks away from the pack.. A signal level of 9 is pretty good, considering the range..
and see their picture.. But, I did not expect to see planes that were not sending their location (lat&long), but just the basic Squawk of ID# & alt.. This is from free software?? WOW! The reason for the lack of planes on the map, is the lack of a real antenna. so I assume he doesn't mind if a few snoopy folks check out VRS at his open website. (Which can be configured for Password entry). You should be able to use the menu tracking and display functions and have the settings 'save' in your web browser. I wanted distance in Miles in the first column and the signal level in the second column. And the plane labels have that info too.. Firefox saved those for me.. Maybe a cookie? I installed a second dongle today. Very easy to do with VRS.. Now have the new dongle upstairs. Small indoor antenna, for now.. Not much range. Maybe later on, I'll build a Yagi for that dongle and get some rare DX..